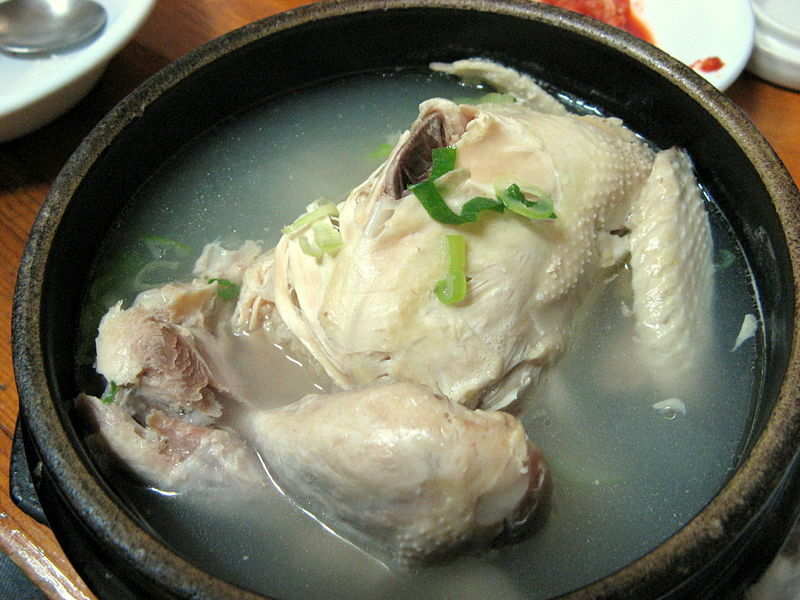 Samgyetang is a variety of guk or Korean soup, which primarily consists of a whole young chicken and Korean ginseng. The dish's name literally translates as "'ginseng chicken soup" in English. Samgyetang is traditionally served in the summer for its supposed nutrients, which replaces those lost through excessive sweating and physical exertion during the hot summers in Korea. To make samgyetang, a whole young chicken is stuffed with glutinous rice and boiled in a broth of Korean ginseng, dried seeded jujube fruits, garlic, and ginger. Depending on the recipe, other medicinal herbs such as wolfberry (gugija), Codonopsis pilosula (dangsam), and Angelica sinensis (danggwi) may also be added. Like chicken soup, which is thought to help common sicknesses in the West, it is widely believed in Korea that samgyetang can both cure and prevent physical ailments. Proteins, minerals, and hormones from the whole chicken mixed with the beneficial properties of the ingredients combined in the dish makes it a revered culinary item in South Korea. Only whole uncut ingredients are used for the dish, as they are believed to preserve the maximum amount of nutrients. Specialty restaurants common in Korea serve nothing but samgyetang, having gained local popularity through their special recipe for the dish which are often kept secret. The dish is usually accompanied by side dishes and, in some restaurants, a small complimentary bottle of insamju (ginseng wine) is included.